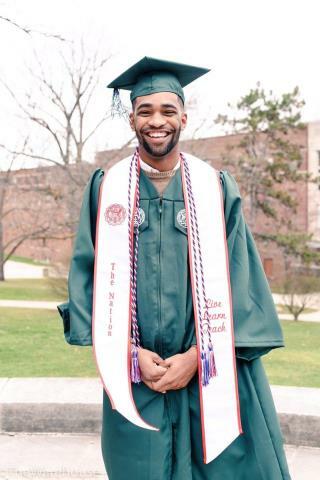 (Newser) – In a moment of reflection on the eve of graduating from Eastern Michigan University, student Daivon Reeder struck a chord on social media with a tweet that has since gone viral. Alongside a photo in his cap and gown, Reeder wrote Thursday: "My step dad told me it was pointless to go to orientation, I wasn't going to graduate.....4 years later he in jail & I'm well....," followed by a line of laughing emojis. Hours later, the tweet began trending in Detroit, catching the attention of Twitter as well as the media. Local Detroit station WDIV 4 featured a segment on Reeder, who graduated Saturday with a degree in criminal justice and a minor in military science. He told the station that after losing his academic scholarship, those words pushed him even harder to succeed. I think it is great he surpassed all expectations. I hope he is able to continue his success, and use the fact that he is doing better than those that judged him. He in jail, I not in jail. I graduate college. 4 year I go to school. He know I the smart one now.